Gordon Carmichael of Kirkintilloch Community Council pays tribute to well known community activist Penny Sinclair, who passed away earlier this year. “Over many generations the town of Kirkintilloch has been blessed to have many active citizens in her midst, people who strive to enhance the area for the benefit of others in their community. Of course, many of these fine people are no longer with us today. Added to that list should be the name of Penny Sinclair, who sadly passed away earlier this year. Penny was a ‘well-kent face’ in Kirkintilloch and was for many years seen walking through the town, taking note of progress and keeping a keen eye on developmental changes, particularly those which restricted access, or which might contravene Planning Regulations. Recognisable yes, well known of course, but who was Penny Sinclair? Penny was born in 1933 in the municipality of the British Consulate General at Tientsin, an industrial town (now Tianjin) in the North East of China. Her family returned to this country in 1937 and moved to Dalry in 1940 where Penny attended Dalry High School. Her further education was at Glasgow Commercial College and her studies led to a successful career in Secretarial Studies, securing a position at United Biscuits (formerly MacDonald and Sons) where she remained until 1969. Her youth involved looking after her Pony named Spectre, and Penny enjoyed trekking in the Ayrshire countryside and may even have participated in local hunts. Her love of the countryside and accessibility would remain significant to her throughout her life. Penny married John (Sinclair) in 1967 and had a daughter Heather who with her husband Mike provided Penny’s two grandchildren Oscar and Charlotte. As a young woman, Penny enjoyed and participated in various Dancing Competitions and gained success in both Amateur Ballroom and Latin American classes, both requiring her lightness of foot. Penny thoroughly enjoyed working in her garden at her house in Hayston and valued social engagements with her neighbours. Penny also enjoyed travel and visited unusual places throughout her life and often these including walking adventures. Foreign visits took her to Majorca, Paris, Reykjavik in Iceland and Bergen in Norway. She enjoyed many canal holidays throughout her life and often walked the towpaths beside the canals. She would later enjoy the work of the Seagull Trust. In later life, she regaled in telling people she was embarking on a walking adventure and when her visitor or listener enquired as to where, she would surprise them by explaining she had secured the support of the British Forces - to visit the Falklands! Yes, she visited there in 2010 and was able to return in 2012, despite her occasional reduced ability to walk in Cowgate! These were remarkable accomplishments, particularly at 77 and 79 years of age. Penny was extremely active in her own community and made herself known to anyone she thought she might gain information or support from. She was resolute in her robust defence of free access, and she often found cause to remonstrate with Local Officers charged with responsibility for planning. Her attendance at local meetings of whatever form or association often resulted in her formidable contribution and was frequently met with a ‘gasp of exasperation’. Nonetheless she seldom left such a forum without being thanked for making an invaluable contribution to the discussions, and often leading to positive actions elsewhere. 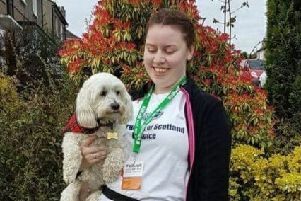 Penny’s love of walking drew her to the values of the accreditation of Walkers are Welcome and she travelled to many places in Scotland and further afield to make enquiries with the association as to how Kirkintilloch might achieve such status. Never daunted by the lack of immediate support or funds, Penny displayed a tenacious spirit that most officials of authority had neither the energy or expertise to refute. Penny used this same approach to ensure the Canal Footpaths (former towpaths) were appropriately surfaced on the approaches to the town to increase and enhance the experience of those encouraged to utilise these country routes. She also secured funds from the ‘Big Lottery Fund’s Awards for All’ to widen the right of way – which runs from the ‘Campsie View estate’ to the ‘Forth and Clyde Canal’ towpath and was successful in raising funds for similar projects. Similarly she cared for the well-being of nature in our area and repeatedly reported on the health of the Swans on the canal. During repair work and upgrades being carried out, Penny was exhaustive in her monitoring of the standards being exercised by workmen and authority representatives. A keen walker, Penny joined the Strathkelvin Ramblers in 1998 and became their Social Secretary in 2001. She held the appointment of Planning Convenor of Kirkintilloch Community Council for several years and regularly updated her colleagues on matters. There was little point in contradicting or trying to correct Penny. She was astute in her practice of pretending not to be aware, or understanding of what was being said. She was also comfortable in any environment, but happiest perhaps enjoying the fresh air of the countryside. A regular visitor to several of the premises in town, particularly the Kirky Puffer, where she was made welcome and looked after by many kind friends. Supporting the work of the East Dunbartonshire Visually Impaired Peoples Forum ( E.D.V.I.P.) was important to her, especially in relation to the local & national campaigning against the “Shared Space Scheme”. She handed out leaflets and attended Council meetings, as they discussed the new Scheme being installed in Kirkintilloch. On learning the public were restricted from taking posters in to Council meetings, Penny in her own inimitable style, simply pinned a poster onto her T- shirt, concealed underneath her jacket, which she proudly revealed to all once inside! Penny also attended when their Petition was presented to the Scottish Parliament against Shared Space Schemes in Scotland. Penny supported the belief this excluded many from town centres and that those who were visually impaired felt excluded. She was keen to see the loss of safe access to the town centre being challenged. Like so many before her, Penny Sinclair played her part in supporting our community and ensuring that when we seek to enjoy our environment, it is accessible and we can do so unrestricted.